VANCOUVER, Nov. 21, 2018 - Kincora Copper Ltd. (the "Company", "Kincora") (TSXV:KCC) is pleased to provide an update on field activities recently completed at various targets. 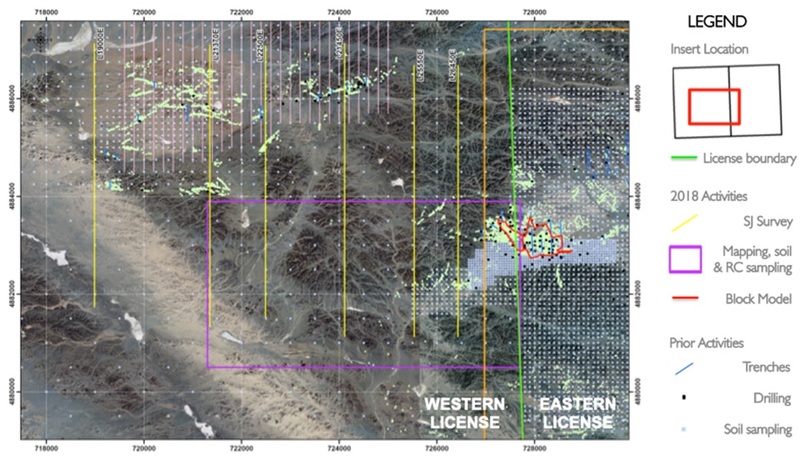 The SJ Geophysics Ltd. ("SJ") geophysical survey's at the Company's 100% owned East Tsagaan Suvarga ("East TS") and Bronze Fox projects were completed on time and under budget. Results are promising, supporting multiple drill targets at Bronze Fox and East TS. In preparation for drilling at both projects over the winter, Kincora has completed a tender for the proposed drilling programs with a preferred drill contractor selected and favourable rates returned. Final modelling and interpretations are expected in the upcoming weeks, supporting the Company's next Technical Committee workshop scheduled for the second week of December. Kincora has strengthened and accelerated its project generation function, becoming the foremost international group pursuing further countercyclical expansion opportunities in Mongolia. In the last 12 months the team has reviewed over 300 projects, with 178 targets "ground-truthed" and better-rated opportunities undergoing more detailed assessment. Peter Leaman, Senior Vice-President of Exploration, stated: "Since the first significant capital raising post the IBEX transaction and establishment of the new technical team, over the last 14 months Kincora has very cost effectively implemented our two pronged strategy. 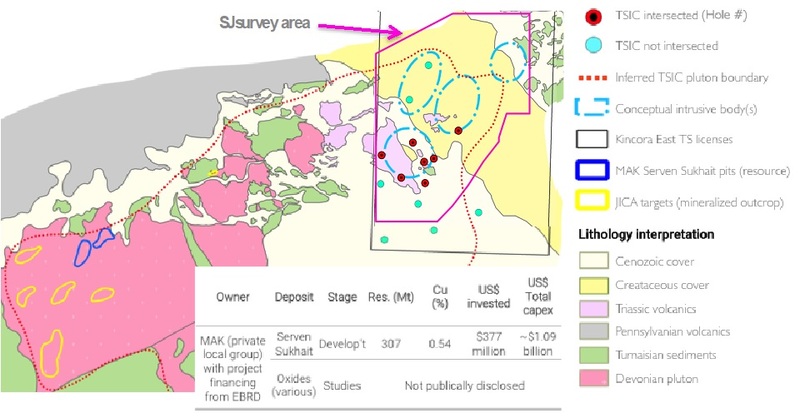 We have commenced the first modern systematic and district scale exploration across our wholly owned and dominant position in the world-class Southern Gobi copper belt, and become the foremost international group pursuing further countercyclical expansion opportunities in Mongolia focused on porphyry copper, gold and VMS targets. These disciplined and systematic approaches are proven to yield results. 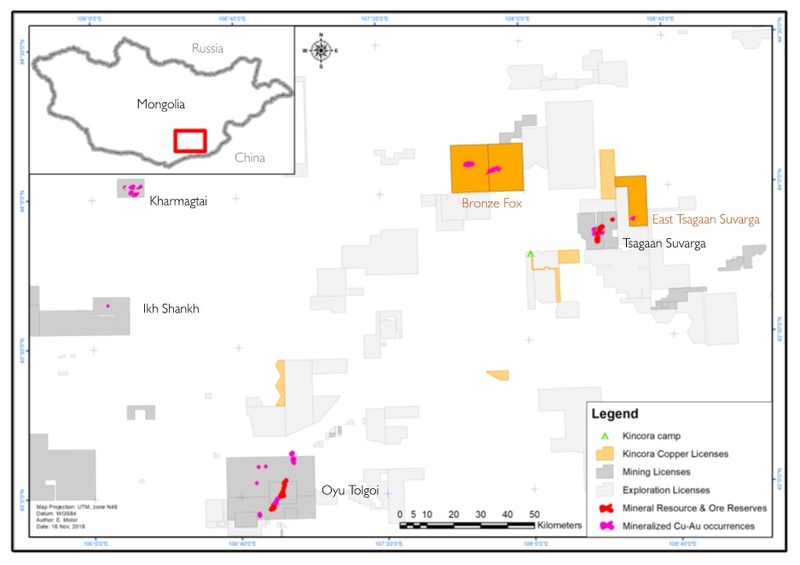 Tendering for drilling contractors has been completed in preparation for drilling commencing, subject to board approvals, over the Mongolian winter at multiple targets at both Bronze Fox and East TS. Significant progress has been made at Bronze Fox, including a new interpretation of the lithology and mineralized system, which coupled with new international geophysical surveys and the full 24,000 metres of drill core being relogged supports multiple high-grade targets for drilling. Bronze Fox is a large mineralized system and three of four holes drilled by Kincora into the monzodiorite section of the intrusive complex intersected over 1% copper and have only tested 260 metres of over a kilometre strike length. Preliminary results of the SJ geophysical survey at East TS have provided significant encouragement, supporting our exploration approach and the concept of a series of Devonian porphyry intrusives at moderate depths in a proven brownfield environment." Across a 7.8km by 6km area of interest a total of 67.8 kilometres of IP, resistivity and magnetotelluric (MT) data were collected along lines spaced at 150m supporting detailed 3D inversions and integration with the existing ground magnetic, gravity and drilling data. First phase exploration previously undertaken by Kincora has confirmed East TS as a brownfield Devonian target beneath explorable cover with four large-scale conceptual intrusive bodies interpreted from magnetic, gravity and resistivity data with spatial correlation with Phase 1 drilling (Cu/Mo assay & magnetic susceptibility). Preliminary IP results from the SJ survey are positive, with broad chargeability highs coincident at three of the four conceptual intrusive bodies. The initial results, which are subject to final modelling and interpretation, are supportive of sulfides associated with demagnetised zones that may represent magnetite-destructive mineralized phyllic or argillic alteration at moderate depths. Final IP, resistivity and MT models, integration and interpretation are expected in the upcoming weeks which will support a detailed review with previous geological results at in the Company's next Technical Committee workshop which is scheduled for the second week of December. The Workshop will refine proposed drilling activities at East TS at the three large interpreted intrusions with coincident chargeability highs located in an unexplored brownfield Devonian complex. Drilling permits are already in place for the three proposed targets. The SJ survey completed a series of 6 North-South DC resistivity and IP lines for 33.8 line kilometres to further refine identified high-grade targets before drilling. The survey has provided more detailed IP coverage, higher resolution with greater depth penetration, to the west of the previous "Search" survey (which at the time was restricted due to access issues to the western license) and across a second intrusive complex, where previous gradient IP had been completed. Following positive first phase pan concentration survey results earlier this year, coupled with previous geophysics, a coincident area for follow up mapping and soil sampling was identified. An initial 1:10,000 scale geological mapping program was completed across this 6.4km by 3.4km area with an infill soil sampling of 200m by 100m (previous 500m by 500m). The results of this latest phase of field season activities, the SJ geophysical survey and improved surface geology from maiden mapping and infill soil sampling, coupled with the earlier pan concentration survey, geophysical and drilling results will be integrated and interpreted in the Company's next Technical Committee workshop which is proposed for the second week of December. The Workshop will refine proposed drilling activities at Bronze Fox with drill permits already in place. In 1Q'18, Kincora strengthened and accelerated its project generation function, becoming the foremost international group pursuing further countercyclical expansion opportunities in Mongolia focused on porphyry copper, gold and VMS targets. In the last 12 months the team has reviewed over 300 projects, with 178 targets "ground-truthed" involving over 12,000 kilometers of road distance. Commercial success for the project generative function is achieving a path to control for new projects that sits within "Target Testing" and "Advanced Drilling" stages of Kincora's project pipeline, where the Company can maximize value to our shareholders and the project venders. Kincora has adopted a detailed systematic regional targeting approach utilising our proprietary database and experience that is backed up by "boots on the ground" field activities, utilising appropriate modern exploration techniques in a cost effective manner. In total, ground-truthing this field season has resulted in a shortlist of six copper-gold targets, often with multiple field and/or geophysical activities, with better-rated opportunities undergoing more detailed assessment. Mongolia's Ministry of Mining and Heavy Industry re-opened the land tender system in 3Q'18, including total proposed land area covering 86,690km2 (or ~5.5% of Mongolia's landmass). To date, 40 tender areas have been announced. In October, Kincora lodged a maiden tender application under the new system for a grassroots conceptual porphyry target. There were a total of three groups that lodged tenders. The Company's application was not successful in the final award of the license. The scientific and technical information in this news release was prepared in accordance with the standards of the Canadian Institute of Mining, Metallurgy and Petroleum and National Instrument 43-101 – Standards of Disclosure for Mineral Projects ("NI 43-101") and was reviewed, verified and compiled by Kincora's geological staff under the supervision of Peter Leaman (M.Sc. Mineral Exploration, FAusIMM), Senior Vice-President of Exploration of Kincora Copper, who is the Qualified Person for the purpose of NI 43-101.